Short walk to the beach. 1br/1ba condo Sleeps 6, great pool! 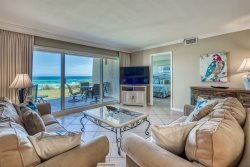 This charming one bedroom, one bath condo is situated in the heart of Seagrove Beach on 30A about 1.5 miles east of Seaside. You are minutes from some of the best restaurants, shops and beaches that 30A has to offer. Beachwood Villas offers two swimming pools, shuffleboard courts, a playground, and community grills throughout for the exclusive use of Beachwood Villa guests. There is a public beach access that is about a 3-4 minute walk from the condo. The grounds are beautifully maintained and give off a lush tropical vibe. A self service laundry facility is also located on site. Once inside the condo, you will notice the numerous upgrades such as tile floors, granite counter tops, and stainless steel appliances. The living area has a flat screen tv, DVD player, and queen sleeper sofa. There are two built in bunks right off the living room that are perfect for the kids. There is a sliding glass door that leads to the patio looking out over the well manicured green spaces. The dining area is situated just beyond the living room and has seating for 4. There are 3 bar stools which provide additional seating. The kitchen is fully equipped with everything you will need for the nights when you are ready to relax and cook your fresh catch of the day. It has been updated with beautiful granite countertops and stainless steel appliances. The bedroom has a king bed and flat screen tv. The bathroom is situated just off the kitchen and right next to the bedroom, has a tub/shower combo and single sink vanity. There are 6 beach chairs in the unit for guests to use. Add $100 for housekeeping and 11% for tax. There is a $30 booking fee and a $69 damage protection fee; 2.5% convenience fee on credit card payments. A deposit of 25% down payment holds the unit for you and is applied toward your final payment.